Gloucestershire's Will Gidman should be considered for an England call-up, according to team-mate Michael Klinger. All-rounder Gidman, 29, has impressed at the start of the 2014 county season, taking 6-50 at Glamorgan and scoring 55 with the bat against Hampshire. And he has the chance to prove his credentials against England captain Alastair Cook on Sunday, when Essex take on Gloucestershire at Bristol. "There's no reason why he can't play for England," said captain Klinger. He told BBC Radio Gloucestershire: "Will is only in his mid-late twenties so he's in the prime of his career. Year after year he's taken wickets and made runs. "Hopefully if he can do the job to someone like Alastair Cook then hopefully they'll start to look at him." After joining Gloucestershire from Durham for the 2011 campaign, Gidman became the first man to achieve the double of 1,000 runs and 50 wickets in a debut season. Two years later he added another record, after reaching three figures with the bat against Leicestershire and also taking 10 wickets in the match - becoming only the fifth Gloucestershire player to achieve the feat. Gidman took 50 wickets in Division Two last season and Klinger says they need to make sure they nurture him through the season to keep him competing. 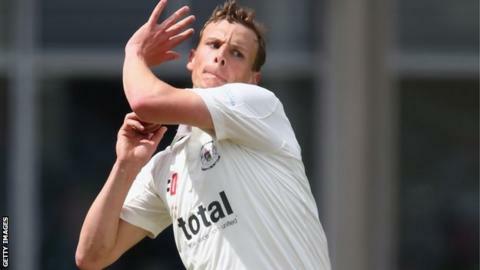 "I need to be careful not to over-bowl him, it was difficult in this game [against Glamorgan] after being one bowler down," said Klinger, who lost bowler David Payne to injury. "Will is in superb bowling form and got some runs in the first game for us as well. He's our most valuable player, there's no doubt about that."